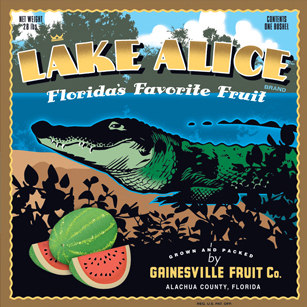 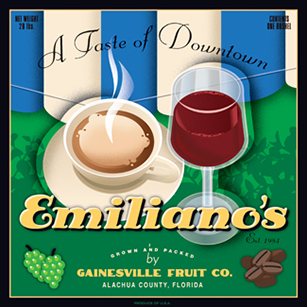 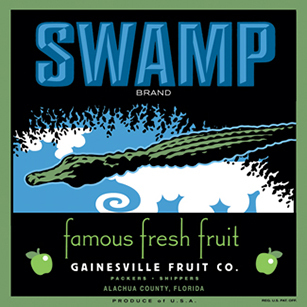 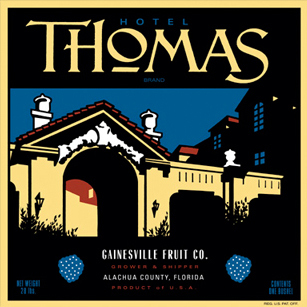 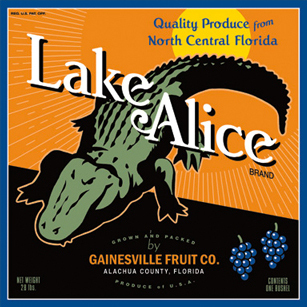 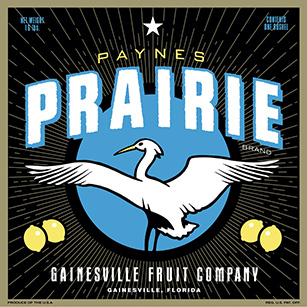 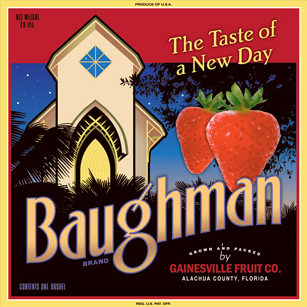 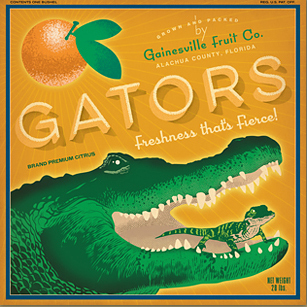 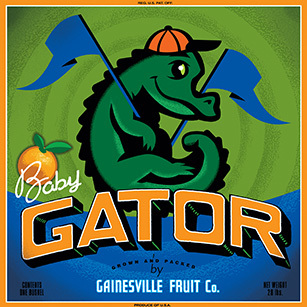 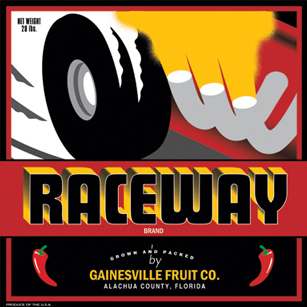 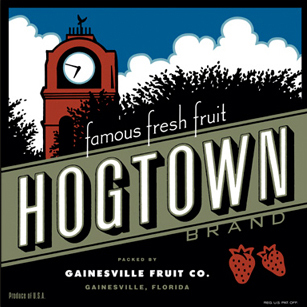 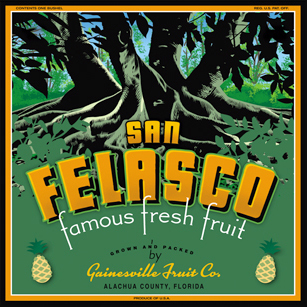 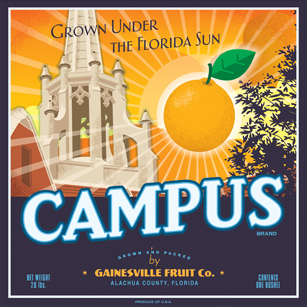 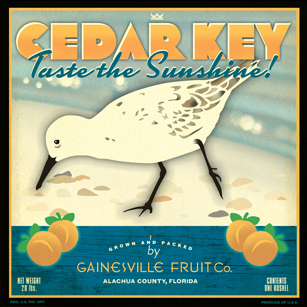 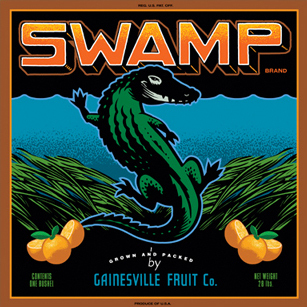 For more than a decade we crafted a series of art prints, in a faux-vintage produce label aesthetic, that celebrated cherished landmarks in and around Gainesville, Florida. 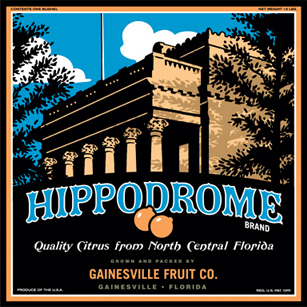 I’m intrigued by the idea that something old can remind us of what’s current; how the suggestion of age or history can make us re-evaluate things that are new. 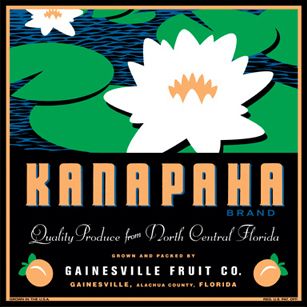 The explorations that resulted in the Gainesville Fruit Co. began for me with a re-introduction to letterpress printmaking by my good friend Patrick Grigsby. 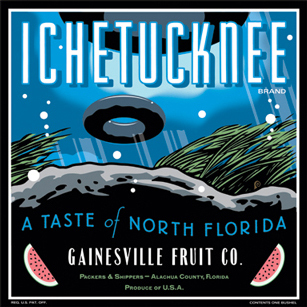 An accomplished instructor of graphic design, illustrator and printmaker, Patrick rekindled my interest in graphic illustration. 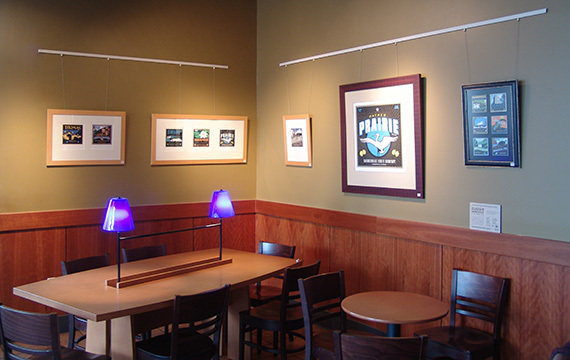 In 2004 I happened to be looking for a personal project that would relieve some looming creative burnout. 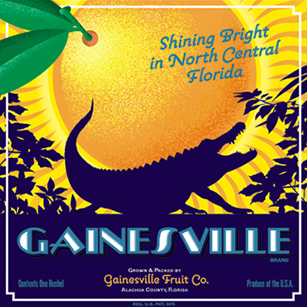 My only thoughts were that it would be nice to do something that reflected my love of vintage typography, and perhaps something that would highlight the Gainesville area, which I’ve grown very attached to over the last 27+ years. 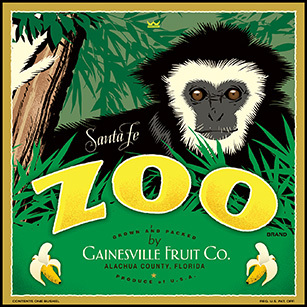 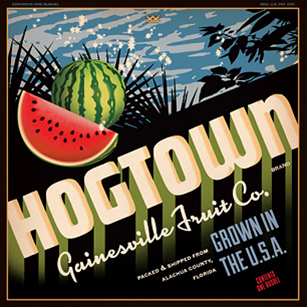 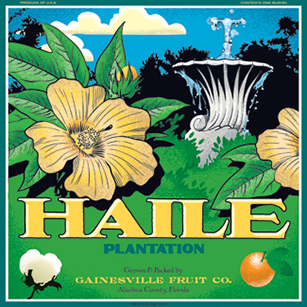 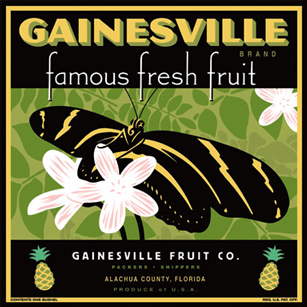 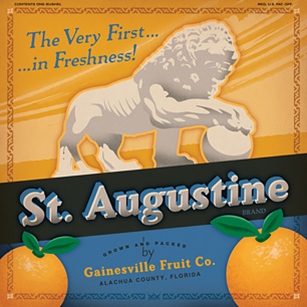 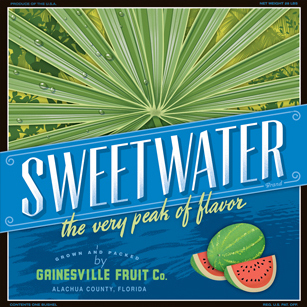 After flirting with the idea of creating an alternate history of vintage Gainesville postcards that never existed, I kept the “faux vintage” concept — but adopted the fruit crate produce label motif instead. 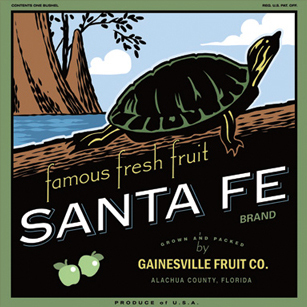 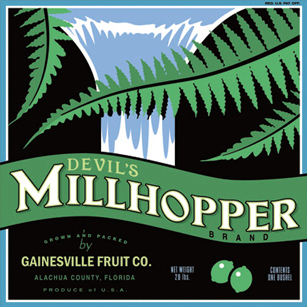 The Gainesville Fruit Co. was the result. 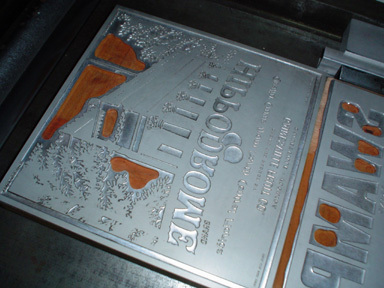 I began the design process, and purchased a 1950’s vintage Nolan proof press — the kind a newspaper might have used to proof a sheet full of hand-set type before press time. 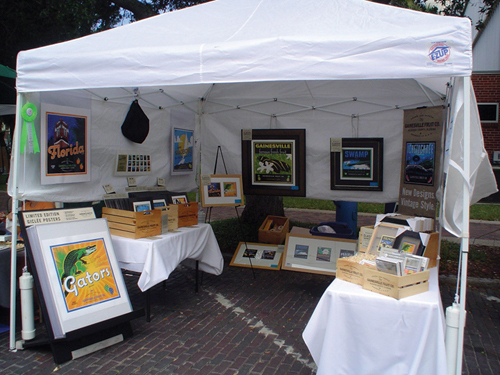 My design process begins with a series of very small sketches, to capture the dynamics and composition of various ideas. 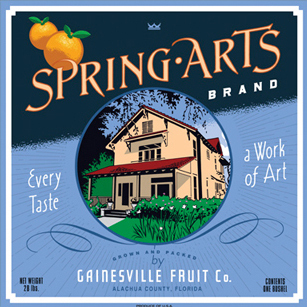 What follows is a back-and-forth method of designing the art that goes from the drawing table to the computer, back again, with each design finally finished digitally. 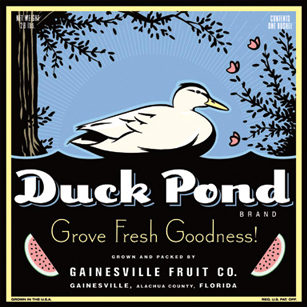 I feel like this process keeps me firmly rooted in the hand crafted quality of those old labels, whether it’s drawing a bird, or hand-rendering typography. 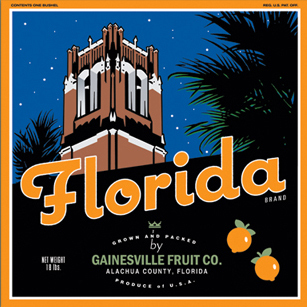 The idea of using flat colors, while not exactly the way vintage fruit labels were illustrated back in the day, was well suited to the process. 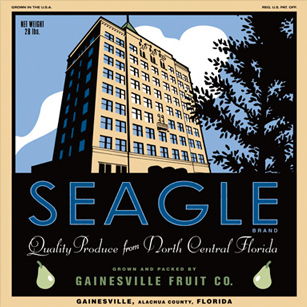 An early idea was to create larger silkscreened versions, and although that plan was abandoned, the flat colors stuck and have become a hallmark of the bold, graphic quality of the designs. 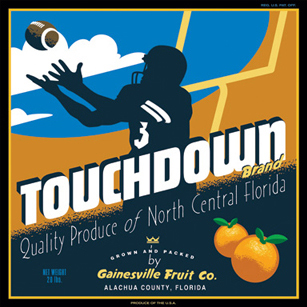 The first set of six designs were produced on the Nolan letterpress, and the series has since been produced in open editions of digital giclée prints and limited edition posters, as well as notecard sets. 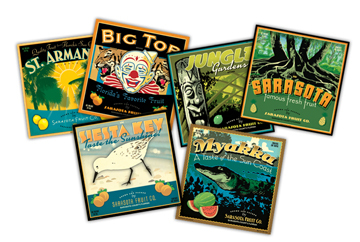 Undertaking this challenge and going through the entire process was extremely rewarding, as it energized me creatively and fueled the creation of 42 designs. 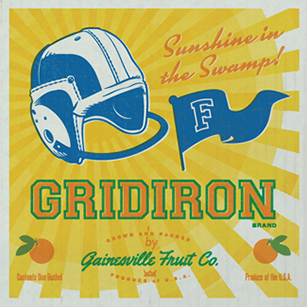 The “faux vintage” idea of (re)creating something that never existed began to reverberate and soon inspired other series like the football game day covers of the Vintage Football Archives and travel posters for the US Bureau of National Wonders. 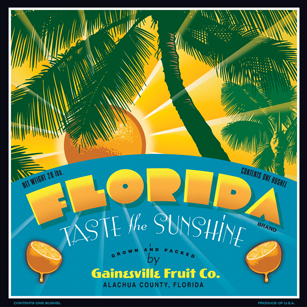 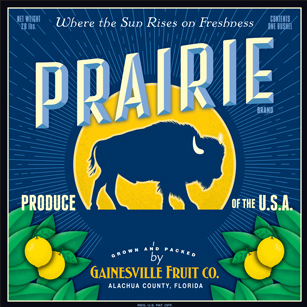 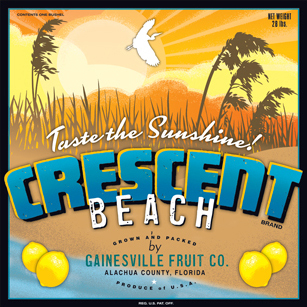 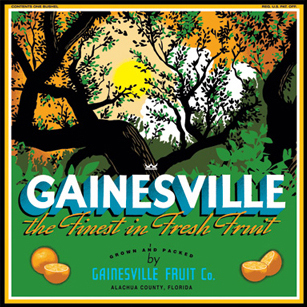 Thanks to a massive winter freeze in the 1890s that moved the citrus growing zone in Florida southward into the Orlando region, The Gainesville Fruit Co. never existed. 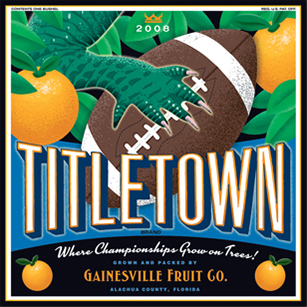 But if they had, these are the kinds of graphics I think they might have produced. 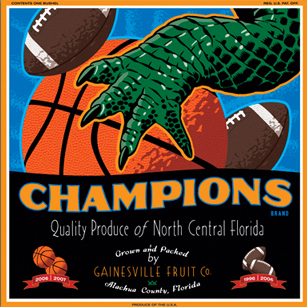 In another era, maybe they would have hired me to be their graphic designer. 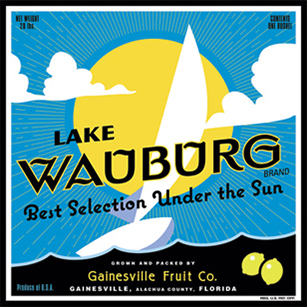 Along the way we also expanded a set of graphics and explored the idea of reaching into Sarasota -- another awesome place with amazing landmarks, natural beauty AND amazing support for the arts. 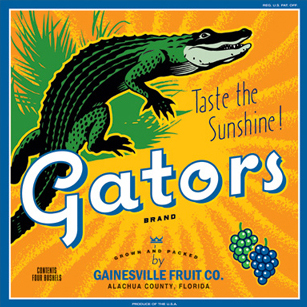 To our surprise, they never caught on.